which requires property owners to secure a permit before doing any construction, reconstruction, development, Etc. For Example: building, major remodeling, placement of manufactured homes, repairing after flooding, Etc. This action is in compliance with the regulations of the National Flood Insurance Program. The Louisiana Legislature has delegated the responsibility of implementation of this program to Washington Parish Government and local government units. Areas of the Washington Parish recently experienced flood inundation which may result in loss of life and property, and cause health and safety hazards. If your home or business was flooded or if you are building in Special Flood Hazard Areas. 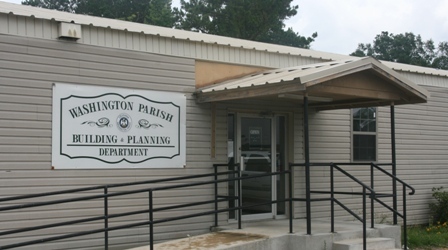 Washington Parish Government Offices at 909 Pearl Street, Franklinton, LA 70438 adjacent to the Courthouse.